SYNOPSIS: It seemed like this James Coburn pool hustler comedy was on HBO cable every month back in the 1980's! Probably because it moves fast, it's funny, rated PG and it stands up to repeat viewings. 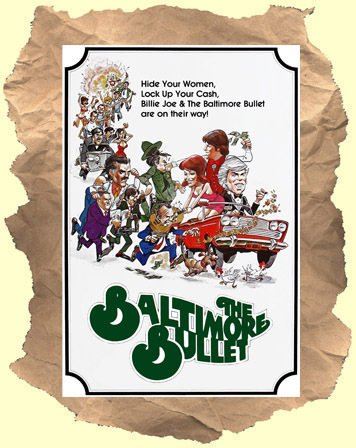 James Coburn is "The Baltimore Bullet". He travels the country hustling games and winning money. His buddy, and student, is eager sidekick Bruce Boxleitner. Finally, Omar Sharif is a no nonsense rival player who likes to gamble big. The first chunk of this film follows our two heroes as they road trip to New Orleans, hustling money (and women) along the way, to play Sharif's whale in a high stakes game. With some nice acting support from (a bizarre) Calvin Lockhart and (a funny) Michael Lerner. Sort of a low budget, light as air, version of The Color of Money (which didn't come out until 1986). I'm no expert on billiards but apparently the film is filled with real-life legends (Willie Mosconi, Steve Mizerak, Mike Sigel, Jimmie Mataya, Lou Butera, Irving Crane, Allen Hopkins, Pete Margo, etc.). Recommended.